Powerlite Lithium Ion 5 Ampere Battery with 160 cold cranking amps at just 1.1 kg. Our lightweight performance batteries are manufactured using high rate LiFePO4 cells and produce huge cranking amps. Lithium battery chargers are included with every battery. Powerlite Lithium Ion 9 Ampere Battery with 300 cold cranking amps at just 1.4 kg. Our lightweight performance batteries are manufactured using high rate LiFePO4 cells and produce huge cranking amps. Lithium battery chargers are included with every battery. Powerlite Lithium Ion 20 Ampere Battery with 630 cold cranking amps at just 2.4 kg. Our lightweight performance batteries are manufactured using high rate LiFePO4 cells and produce huge cranking amps. Lithium battery chargers are included with every battery. 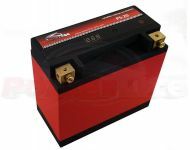 Powerlite Lithium Ion 30 Ampere Battery with 800 cold cranking amps at just 3.3 kg. Our lightweight performance batteries are manufactured using high rate LiFePO4 cells and produce huge cranking amps. Lithium battery chargers are included with every battery.